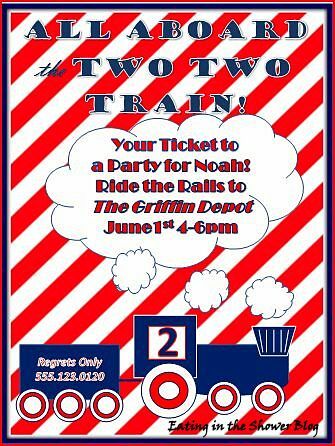 I had so much fun throwing the little one a train themed birthday party this May when he turned two. He has been obsessed with trains for quite a while so it was great to be able to decorate with some of his favorite things. My sister and I made his cake and I'm so happy with the way it turned out! Friends and family climbed aboard the 'two- two' train and helped us celebrate. We decorated the walkway with railroad tracks made from duct tape and made a railroad crossing sign to greet guests as they arrived. I created these invitations I showed you here using powerpoint. Our little conductor got the biggest kick out of seeing himself drive the choo-choo on the banner I made him. I painted red and blue trains to decorate the mantel and painted a red and white striped 2. I found some fun red, white, and blue decorations that I'll be able to use at many other summer holiday parties. We rented a hot dog roller both so we would have the food covered in the event of rain and so that no one had to man a hot grill all day in the sun. It was nice to just set it and know that the food was ready. I'm so happy that we were able to share one last party with our family and friends before we move and am grateful for every laugh and smile that filled our backyard that day. Stay tuned- there are more party details to come! Your son's eyes must have lit up to see all that - I love it. Great job Mom! I love that cake stand! Very cute cake, love the "two two"
This is so incredibly cute, Kate! I'm in love with that adorable cake! !